Father Vincent, Stephen, Gertrude, Msimangu, and Absalom’s girlfriend go to see him in prison. Absalom seems to believe, for a moment, that they have come to tell him some good news, but Stephen gently tells him they are there to perform the wedding. He looks upset, but then holds her hands. They inquire after each other’s health and fall silent. Stephen notices that Gertrude looks like she’s about to burst into tears, and he sternly reminds her that this is a wedding, and if she’s going to do that, she has to leave. The act of marrying Absalom and the girl is in some sense a formality for her sake and the child’s—they will never touch each other again, nor will they grow old together, nor will the child know his or her father. And yet it is also a form of faith—a marriage in this life will live on in the eyes of God—and a way to legitimately bring the girlfriend into Stephen’s family. They go to the prison chapel. Father Vincent performs the marriage. After it is over, the others leave, and Stephen and Absalom have a talk. Stephen assures Absalom that he will take care of the unborn child. Stephen also tells Absalom that he will be returning home tomorrow, and he will tell his wife that their son is keeping her in his thoughts. Absalom says that he has some money for his own wife and child. He also asks that the child be named Peter, if he is a boy. Absalom breaks down, falls to the ground, and begins sobbing in fear for his own death. Stephen holds him, and tells him to have courage. After some of this, Stephen tells Absalom that he must go, and repeats that he will care for Absalom’s wife and unborn child. Absalom clutches at Stephen’s legs and begs him not to go. Two guards come and have to pry Absalom off Stephen, and Stephen leaves him screaming and sobbing. Outside, the girl says to Stephen that she is his daughter now. He agrees, but is too distracted by his grief to think about it any more. Absalom finally understands his duties as a man, husband, and father: he has money for the child and his wife, despite the fact that it is the last that he will ever provide for them. His stoic demeanor, however, is eventually broken, and Stephen is reminded that Absalom is still very much a child, afraid of death. After they leave the prison, Stephen goes to visit his brother at his carpenter shop. John agrees that it is good that Stephen is bringing Gertrude, her child, and Absalom's wife with him to Ixopo. Stephen says that there is an issue they need to discuss, and John immediately becomes defensive, insisting that the case was out of his hands. Stephen interrupts him, saying that wasn’t what he was going to talk about. Stephen tells John that he should be careful for his own son, lest he be consumed by Johannesburg like Absalom. He also cautions John to be careful with his politics, and when pressed, lies and says he had heard that a person who had come to hear John speak may be a traitor. John is angry upon hearing this, but when Stephen suggests that John’s son was a similar traitor to Absalom, John becomes outraged and violently ousts Stephen from the shop. Stephen returns to Mission House, full of sorrow that he wasn’t able to reach his brother. John is naturally defensive about the lies his son told to get off scot-free. He put himself and his family above Stephens’, just as he puts his own status above the fates of those he leads. Stephen makes up the lie to try to convince his brother to give up his quest for power over goodness, but when he cannot resist pointing out that this betrayal is like John’s son’s betrayal of Absalom, John’s rage drives them apart for good. John believes in man doing what he can, while Stephen puts his faith in God, and the two viewpoints don’t mix (though the novel clearly indicates that it supports Stephen’s view of things). Meanwhile, James and Margaret are also preparing to leave Johannesburg. James leaves a large sum of money to John Harrison to start a club, possibly in Arthur Jarvis’s name. The only way money is ever good in this novel is when it is not needed, or is passed freely from one person to another as a gift or offering. That night, there is a going-away party for Stephen. Stephen is distracted, but gives a small speech. Msimangu tells Stephen that he has given up all of his possessions, and gives Stephen all of his money, to help repay what Stephen has spent in Johannesburg. After he is gone, Stephen counts the money, repents of the fight with his brother and the lie that he told him, and prays for his son. He sleeps, and when he wakes, prays for Msimangu. He wakes up Absalom’s wife, and when he goes to wake Gertrude, he finds her child, but she is missing. Gertrude has disappeared, presumably to become a nun, and Stephen will never learn where she went. In this case, his unknowing is not concealing something dark, but something light: she has gone to find comfort in faith. Machado, Carmen. "Cry, the Beloved Country Book II, Chapter 29." LitCharts. LitCharts LLC, 5 Aug 2013. Web. 18 Jan 2019. Machado, Carmen. "Cry, the Beloved Country Book II, Chapter 29." LitCharts LLC, August 5, 2013. 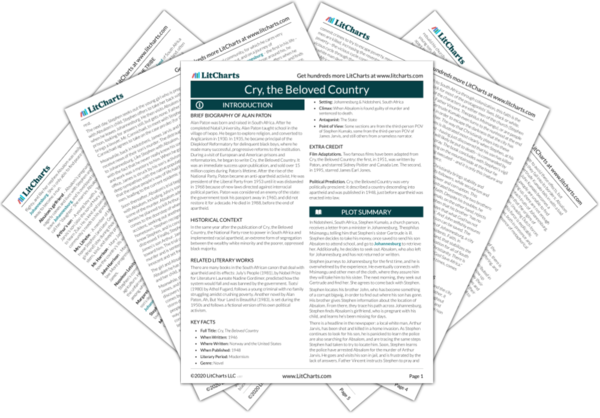 Retrieved January 18, 2019. https://www.litcharts.com/lit/cry-the-beloved-country/book-ii-chapter-29.